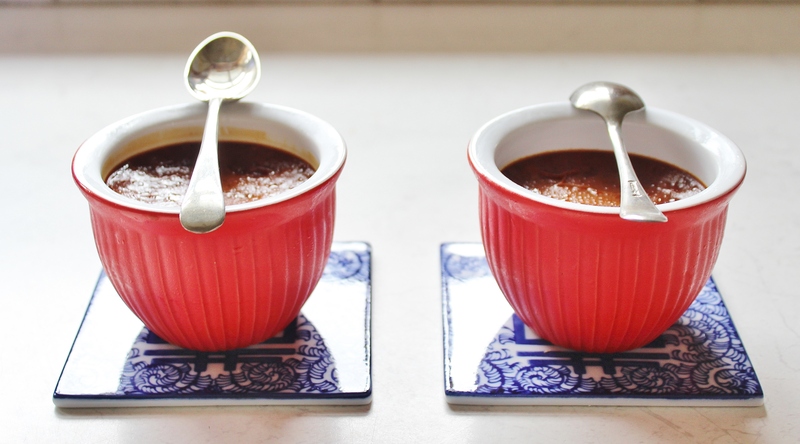 I went through a phase where I made about 50 different kinds of pots de crème for the blog. It was a delicious time! I haven’t made one in a long time, so I figured, with Autumn chills creeping in, that a comforting little toffee pot would be warmly welcomed. The warm little pots are indulgent and smooth, the perfect little treat for a night snuggled under the blankets. I wish that I had taken them to the outdoor cinemas the other night – The Boy and I went to North Sydney moonlight cinemas and it rained! Luckily we could run for shelter and continue to watch the movie…then the inflatable screen screen blew over and we missed about ten minutes of the movie. We had a bit of a shiver and a giggle as we tried to make out what was going on in the movie in the trees it was being projected onto. It would have been the perfect moment for one of these toffee pots! If you’re having a fairly average day, pop a quad of these babies on to cook, I assure you they’ll make you feel better. Put your water, then sugar in a heavy-bottomed saucepan over a low heat. Putting them in the saucepan in this order helps to keep the sugar from burning. Stir until sugar has dissolved. Turn the heat up to medium-high and bring to a boil. Boil for 6-9 minutes, without stirring. Working quickly while the sugar is boiling, whisk together the eggs and egg yolks and set to one side. Measure out your cream and set to one side. Grab a sieve and keep it handy. If you think part of the sugar mixture is catching before the rest of it is ready, pick the pan up and give it a swirl. If it starts to smell bitter, whip it off the heat immediately, it’s burnt. 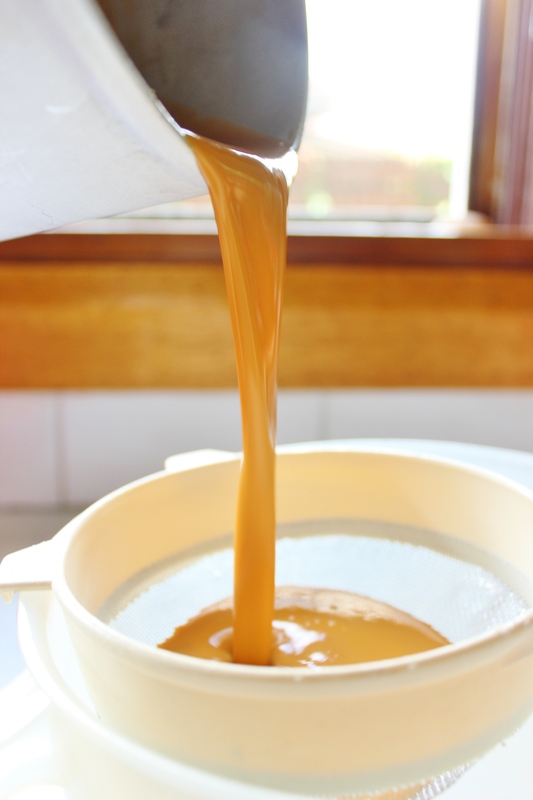 When the sugar has turned a medium caramel colour, take it off the stove, swirling it so that it doesn’t keep cooking too much. Working speedily, pour in ¼ of the cream mixture and swirl it into the hot toffee – it my sizzle a little bit, so watch out. Pour in the rest of the cream in three batches, mixing after each addition. Do the same with the egg. Fit the sieve over the top of a jug and transfer the mixture from the saucepan into the jug. The sieve should catch any bits of toffee that may have hardened, and gluggy egg bits. Pop your kettle on to boil. Pour the mixture evenly into the four ramekins and place them in a cake tin. Slide your cake tin gently into the oven and pour boiling water around the ramekins, about ¾ of the way up their sides. Shut the oven door and leave them to cook for 40-45 minutes. When you get them out of the oven they’ll have bubbled up – don’t worry, they’ll smooth out. Leave them to cool for half an hour, then pop them in the fridge for at least an hour. 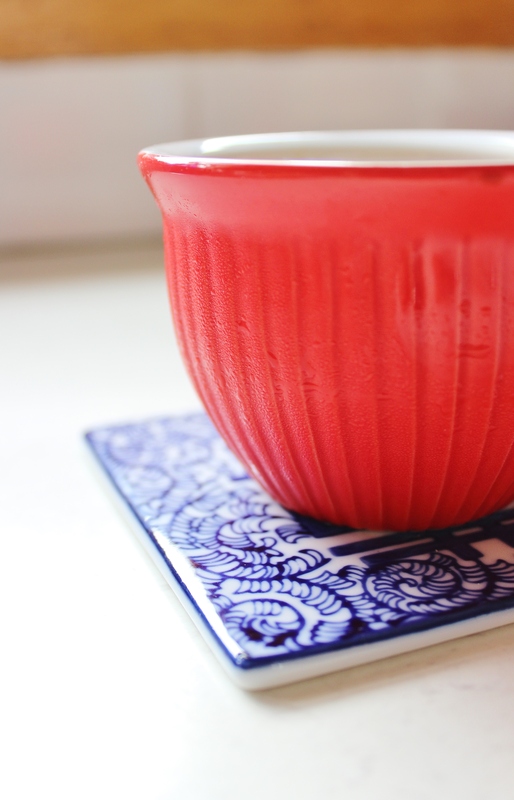 If you’re admiring the gorgeous little coasters, they’re happiness coasters from Junie Living. I’m such a sucker for blue and white, I’ve fallen in love with them. Toffee is my favorite flavor and I’ll be obsessed with these desserts until I give the recipe a try, look fabulous! Oh thank you Sylvie! 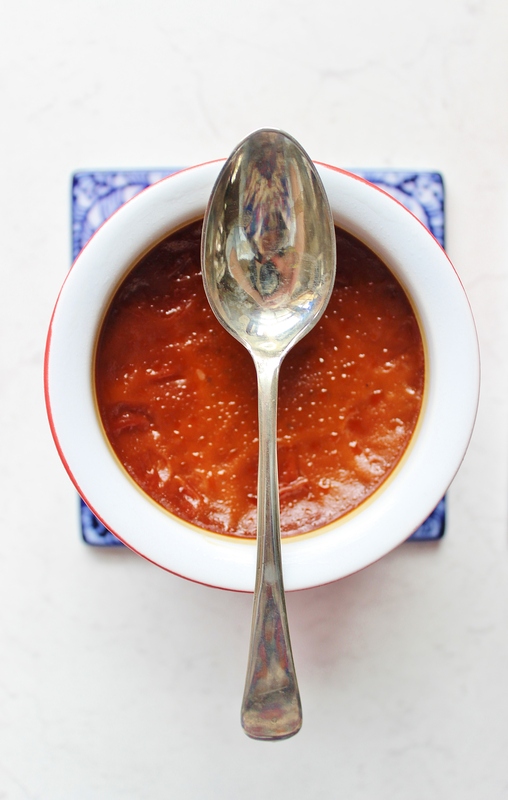 I hope you do get to give it a try – I’m toffee obsessed as well!